Here you need enter a server name or server IP address and a full path to the database file on server. Please note that this is a local path to the database. You should not enter a server name or a network drive here. 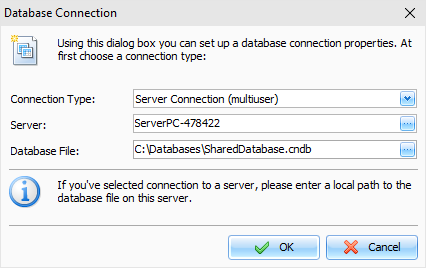 For example, if your database in the "E:\Databases\c-organizer.cndb" folder on your server, you should enter this path when create or add a database connection. login - SYSDBA, password - masterkey. 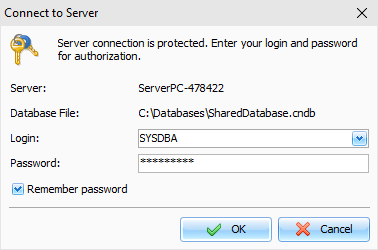 You can change default password for SYSDBA account in the "Users manager" window. Click OK and you will be connected to the database. Now you can add users in the "Users manager" window. This function is available only for SYSDBA account. After this you are ready to work. Just add a server database into the "Database manager" window on all client computers and connect to this database.